Tea, Kumys, shubat and kymyran were the traditional drinks of Kazakhs. The tradition of drinking in Almaty originated in 1965, with the development of the Virgin Lands campaign, a set of measures to increase grain production in the USSR. From 1954 to 1956, 640,000 people of different nationalities arrived in Kazakhstan. They were carriers of different traditions and cultures, and brought the consumption of strong alcohol. Since the days of the USSR, the traditional drinks consumed by the majority of people in Kazakhstan were Moldovan and Georgian sweet wine, fortified wine such as port, and vodka and beer. The first cocktail bars in Almaty appeared in 2007 and the most popular cocktails were Mojitos and sweet shot drinks. Kazakhstan is a very large country and in each region of the culture of consumption of alcoholic beverages is different. Almaty and Astana, being the capital and financial centre of the republic, are developing in the bar industry much faster than other cities. Since 2014, conceptual small bars with classic cocktails have been opening, but these bars didn’t begin to gain popularity until the end of 2017. Today in Almaty there are several bars in which there is a massive choice of alcohol and bartenders are highly qualified. The top bars include Barmaglot, Restobar 6/45, Elou Dor and Kalun. In view of the specific geographical location of Kazakhstan and relatively low population concentration in the cities, many spirits are not imported into the country. A World Health Organisation survey shows that 46% of Kazakhs aged 21-65 rarely drink alcohol or do not drink at all; 54% drink alcohol regularly; 21% drink vodka as the main alcoholic drink. Beer is also popular in Kazakhstan. The first brewery appeared in Almaty in 1874 and has not only survived, but still works. To this day people often choose to drink in bars, pubs or restaurants rather than at home. Once people began to travel more often around the world, they began to understand more about alcoholic beverages, wine and cocktails. But still the consumption remains focused on sweet or sour-sweet cocktails. For several years the Negroni and Aperol Spritz have been popular. In Almaty the Bartenders Community Kazakhstan was developed in 2014 and regularly conducts training seminars and masterclasses for bartenders, with the involvement of international specialists. It also organises regular bartending competitions. On the international scene, Kazakh barmen are not as active as they could be, but every year they are actively developing and eager to be competitive on the international market. 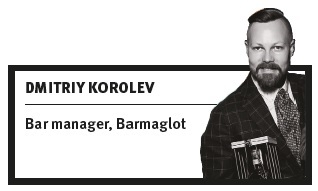 In this regard, team Bar Barmaglot (Bezverkhov Anton, Gilmanov Timur, Almenkulov Yeldos, Korolev Dmitry) is doing well, bringing guest shift bartenders into the bar from the CIS countries and Europe to willingly share their knowledge and experience. In 2017, Bar Barmaglot participated in Festival Barometer in Ukraine, surprising everyone with a kumis and a local balm cocktail. The team also participated in the Barproof awards in Russia and made it into the top three in several categories. And in 2017 the team was nominated for a best bar team award by Neon Shaker. We went to share our knowledge and experience in Kyrgyzstan, Uzbekistan, Georgia, Belarus and Ukraine. The boys undertook some scientific research and wrote an article about kumis (fermented mare’s milk) and its use in cocktails. This article gained the interest of Tales of the Cocktail. The guys also did great work on shubat (fermented camel’s milk) and its use in the bar. In fact, the Barmaglot team commands the development of the culture of drinking in Kazakhstan. This year they started to promote low-alcohol cocktails and they account for more than half of the menu. Kazakhstan will most likely appear on the international bar scene in the next three to four years.